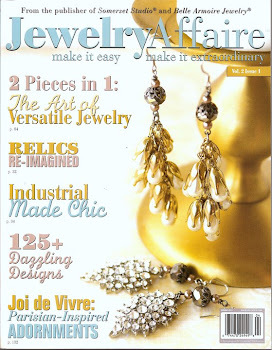 Sparkles From June Beach: Blog Hop with Carmi! I got a lovely package from Carmi to create a few pieces from and here they are……Course, leave it to "sparkle" girl to add some of my custom pendants that I made from various Swarovski Elements to complete the pieces! I love the faux wood grain resin pendant with Swarovski's Ceralun two-part epoxy clay which is my favorite clay these day, especially the metallics but I used black for this project. 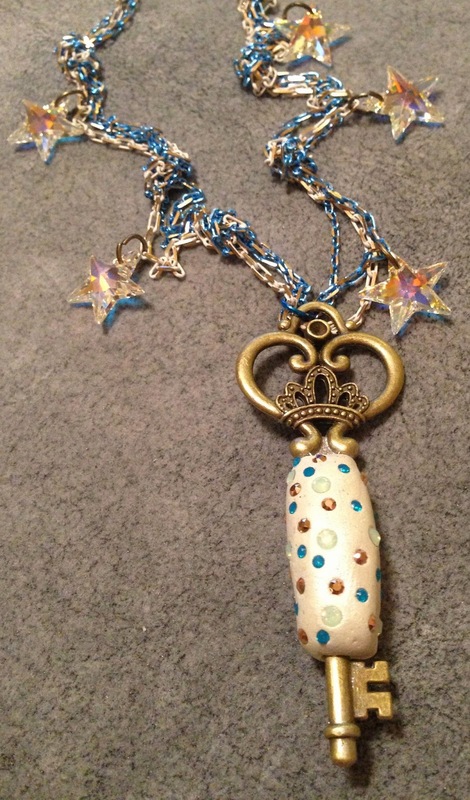 Here is another necklace I created with a key pendant wrapped in Swarovski Elements Ceralun Two Part epoxy clay with Swarovski Elements Chatons and Star Pendants mixed with John Bead Dazzle It Neo Chains in cream and blue, jump rings and closures! LOVE!!! I simply took 3 of the Dazzle It chains and made random knots to create the base of the necklace, added jump rings, closures before adding the pendant and Swarovski Elements star pendants. Note: John Bead is a wholesale only company, so you need to have the proper credentials to buy from them directly but all the materials are available from their various suppliers. Enjoy! Can't wait to see what you create!! very nice job! I spend time getting knots out..who knew!!! Beautiful, June! The pieces are lovely and I love what you did with the key. June I have such a thing for stars and I must say I have fallen in love with your star chain piece! The crystal work on both pieces is lovely and I'm just nuts about that color combination of brown, Amber ANC bright blue. Gorgeous makes! 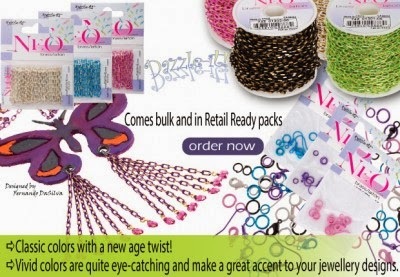 Love all the bling you brought with the Swarovski Crystals. It really makes the chain pop. Beautiful work! 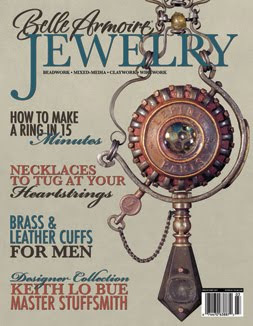 I found one of your wonderful projects in the 2010 'pearls' magazine, Elizabeth's Pearls. I was wondering if you could tell me where you found the clover components with the pearl or crystal center.I have scoured the internet looking for them, with no success. Would you please tell me where I may find them. Thanks! Blogs We Love Here At The Beach! All written, photo, and graphic design content on this site are the sole property of June Beach Collection and June Beach. Please do not copy, borrow, reproduce, or otherwise approximate any content from this site without written permission from the above. Thank you. Copyright 2014- June Beach. Simple theme. Powered by Blogger.